The super hit duo of ARM + Vijay is back. 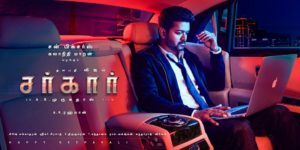 After resounding successes in their earlier combinations, Sarkar has reached skyrocketing expectations with the movie giant Sun Pictures producing it. A strong technical team backing up the duo and the main ingredient “Controversy” to propel it to success, Sarkar made all the right noise before the release. The story(controversy) of Sarkar is public knowledge now. Yes the plot is an interesting and an inspiring one too. The script of Sarkar borders on being very decent, but then the screenplay is the villain in Sarkar. The screenplay has been compromised to showcase Vijay at “Vere Level” and that bugs the narration so badly that the focus of the plot is lost in this mindless circus. The first half unnecessarily stretches beyond its limits to project Vijay and explain the plot, while the second half is filled with logical loopholes that the viewers can sleepwalk through. The songs further the annoyance and it takes the character of Varalakshmi to bring some semblance to the film. By then the film has lost its relevance and wait, you have Sundar Pichai, Narayana Murthy and even Jethmalani as characters. Jethmalani would cringe in his gown as the hero gives him most of the “wise counsel” that ironically the famed advocate is ignorant of. Vijay tries his best to be suave, swag, cool and what not. Vijay attempts a totally “inspired” style and it sadly does not stick. He looks tired and unconvincing. Keerthy Suresh is a dud in her inconsequential role. Radha Ravi does a decent job. Varalakshmi pulls out a convincing performance with a template look. Others do not matter in the film. Girish Gangdharan works the angles well to elevate Vijay. ARR’s background score is largely ineffective and the songs do not make the cut of a Vijay film. Sreekar Prasad’s editing warrants some flak. Action choreographed by Ram – Laxman is not Diwali material. Dialogues are OK and direction ordinary. Sarkar is ARM’s weakest work and it takes a particular scene when he is on screen to remind you that it is ARM’s film. Sarkar had the right ingredients but is a cooked poorly and served badly dish for Diwali. Perhaps SARKAR could have been better as SENGOL..